Justin Barney: So you’re come to Milwaukee November 6, which is an election day. Justin Barney: Are you gonna get political? Judd Apatow: Well I guess I’ll have to it. I mean it’s an election day. Justin Barney: It’s hard to avoid. Judd Apatow: Well you know, people gotta go vote, then they can take a break for a couple hours then go home and watch the returns and whoever you’re rooting for I’m sure it’ll be an emotional night. And so it’s good to take a break. Justin Barney: Yeah so are you gonna do a standup set or are we just chatting or what? Judd Apatow: I’m doing stand up comedy you know, I have a special on Netflix this year called “The Return” and yes I’ve written a new show that I’m doing now and just about any people on those happening here in my world and a little political talk. I don’t know if that night people will want more political talk or none at all. Justin Barney: What would you prefer? Because me, I’m wrapped up in it and so I am like, there are so many people that I know that are like “I want to just get out of it, I want to think about something else.” Where I am like, I want to dig in, I want to go harder. What is your persuasion there? Judd Apatow: Generally when I’m home, when there are people on tv doing great political humor on the talk shows, most of the time I don’t want to watch it because I’ve watched so much news all day. For some reason I feel like everything is so serious I don’t want people to joke about it. Justin Barney: Dude, I understand that. Judd Apatow: I’m so exhausted from it. But every time I watch something like Seth Myers I’m always amazed at how funny and brilliant they are and I’m so impressed and I like writing jokes about it, and I like talking about it on stage but when I get home I’m usually watching so much that I need to shut down. Justin Barney: Yeah I think it depends. Because if it’s really good, there’s like something that a couple comedians do where, it’s like, you find the humor in it and you also find the issue at its heart and you really expose that one thing and it’s like – wow that’s powerful. Then there are comedians who are just like ‘how crazy is this’ and I’m like that is not helping the cause, you know? Judd Apatow: Yeah I don’t know if any of it helps the cause honestly. I do think we need to blow off steam but I don’t know how much of the satire is changing anyone’s mind. The people who disagree with certain comedians probably don’t watch them. Hopefully something positive will happen ‘cause I believe we just want a world that’s more compassionate and I’d like more people in the world to be kind and caring about our feelings. I feel like what’s happening, it’s almost like it’s meant to make us insane. I would like politicians to realize they’re also responsible for our spirit and I wasn’t a big Reagan fan, but a lot of what people liked about him was he tried to make people feel good about America. You don’t really hear much of that, it’s pretty dark everyday. The one thing about Trump – and this isn’t a joke – he loves brawling, he loves fighting every day. I don’t think he cares that it really wears on people, all the conflicts. It’s tough, he’s a bare knuckle brawler and if there isn’t a brawl to have he’ll just be like ‘I don’t trust the FBI!’ and start one. We do need a break, we’re all frayed from it. Justin Barney: I think he thinks that because fighting is the way that he wins, if he’s not in a fight like what’s he gonna, do be compassionate? It’s incapable you know, it’s like he’s floundering then. So it’s like when he’s got a fight he’s got a direction and people get riled up you know? Judd Apatow You know it’s funny, making other people feel good if not his move. Judd Apatow: His move might be to amuse people by calling someone an idiot. But he doesn’t really know how to make anyone feel good without hurting someone else. Judd Apatow: That’s why when we heard that he’s obsessed with Shark Week we’re like “Oh it makes total sense.” He loves that battle, he loves that dangerous character. Hopefully we’ll have some calmer times ahead, but it doesn’t look that way. Justin Barney: And then for the show, you’re doing stand up. The thing that I love about your writing for shows and producing is you do this thing, or my favorite part is we have somebody that you don’t think is going to give really great advice. Suddenly this person that you’re supposed to not like does something and you’re like, “God, they’re great.” I think it’s this really great understanding of the human spirit. How do you get that character into your stand up, or how do you translate that to stand up? Judd Apatow: Most my stand up is just about how, I just don’t know if I’m doing anything correctly. A lot of stand up is about people saying “This is how it should be done, and this is where everyone’s wrong, and here’s my ideas.” I think I mainly just say, I don’t know I’m screwing everything up. Justin Barney: God, and isn’t that so refreshing? And I feel bad for her! I feel bad that she has to stare at me and my wife all day long. So a lot of what I’ve been talking about lately is just how you really don’t know if you’re raising your kids correctly. You know, in California, marijuana is legal. So it’s hard to be like, “Don’t smoke pot,” because it’s literally legal. So now, you’re not really teaching your kids to not do drugs, you’re actually trying to teach them to do it well. It’s just a completely different world from when I was a kid and we just don’t know damage were doing. Justin Barney: Yeah, but is it better to have this understanding because it’s more pragmatic, like looking at it and being like okay, well we got pot and it’s legal now instead of living in a world that is black and white there are things that are good and there are things that are bad. I think it’s scarier that it’s like, where is that in between? But don’t you think it’s like better than being like “don’t do this and do this” because then that creates some real issues. Justin Barney: Maybe you’re holding them back severely because they’re gonna have a job and it’s something to do with that phone, right? Judd Apatow: Yeah, but you know you’re like “Go read a book you’re supposed to read books that makes sense,” but then what if you have the one kid who just can’t use any of modern machinery because you forced him to play with Lincoln Logs. You just don’t know. That is what I find terrifying about it. Judd Apatow: Well my hair was dark and now it’s grey, so it was a while ago. Justin Barney: But I loved your contribution to that and I loved it so much. Judd Apatow: Well it’s funny because I didn’t even realize that when we were doing it, near the end of Hal Ashby’s life he worked on movies and a lot of studios would fight about the edit with him. There was one movie where he was literally hiding the print of the film at his house and wouldn’t give it back to the studio. And I was talking about it in an interview and I said you know, the thing is, a lot of times the studios say “I’m gonna give you total freedom,” and then you start making the movie and they completely lied and they fight you on everything, and it makes you feel insane. Justin Barney: That like, little tiny nugget of insight totally made me understand the whole thing. Where it’s like, why is this dude so upset at these people? Like I get why you’d be upset with with people trying to control you, but that made me really see it as (you know, working in entertainment as well), you get a bunch of people that are like “yeah we love you, you’re gonna be able to do this and this and this” and then there’s no way that they are going to do that. Then it is that series of lies, so that little bit of insight made me see that. Judd Apatow: Well I have to say that for me, that’s the one area where I do get like nuts. If I have an edit of the movie and someone wants to make me change it against my will, that is where I’m like to looking for gasoline in matches. There’s something about it that, it’s like Led Zeppelin made “Stairway to Heaven” and someone was like “you gotta cut the bridge part in the middle, it’s too long” you would want Jimmy Page should go chase them down and beat them up. It’s hard to control yourself because it’s so important to you and all you have is your vision but a lot of times other people are paying for the project and they have a contractual right to do whatever they want with your movie, like you actually don’t have control the movie, and that’s when it gets ugly. Justin Barney: Yeah and that’s the tough part because there’s a part of you that has to recognize and you can see their side. Judd Apatow: Oh sure yeah, because most of the time the director does do a terrible job. Justin Barney: Right? Sometimes I think of that too where it’s like, we love the story where, especially Hal Ashby, he was on the right side of history, he was doing the right things, what ended up being produced was true art. We love that story, but you never hear the story of the executive that went in and cut the film and it changed everything and it was way better. Because they did that. Judd Apatow: But also those movies that Hal Ashby’s fighting about, which are not strong movies, when you watch them you don’t think ‘he could have edited this a little bit longer it would have been great. Like, it doesn’t seem like there’s a good movie in that footage. So that’s where you want to be on his side, but he also might have been off his game on that one because, even the best filmmakers, if half their movies are great it’s a miracle. I mean, Scorsese’s got some clunker movies, everybody does. So it happens and then the film executives are the ones that have to deal with it so I both hate them and have great love and compassion for them. Justin Barney: I love that. I love “Crashing” as well I listen to Pete Holmes religiously and I think of him as like my personal friend that I never get to talk to but he talks to me for like two and half hours every week. So I love “Crashing” I just want to say that. And “Zen Diaries of Garry Shandling,” what is that? What’s going on? Judd Apatow: Well, I made a documentary about Garry Shandling about his whole life and it’s a two-part four half hour documentary. It’s just a very deep dive into a complicated, hilarious, brilliant man who was also a bit tortured and you really learn why he was the way he was, you know we just won an Emmy for best documentary this year and people had a very strong reaction to him because he was someone who went through a lot of stuff in his childhood and he tried to take the pain of his life and turn it into art and comedy. He tried to lift people up by using his pain and suffering as father for his creative life. Justin Barney: And what a genius I mean, I can’t wait to to dive into that because I love him. And finally I will let you go but, “Bridesmaids,” parts were filmed in Milwaukee or it takes place here – pride of Milwaukee. I just want to tell you how stupidly were love that there was a movie where somebody was from Milwaukee. Were always kind of like, you know we’re next to Chicago we have like an inferiority complex and we love the choice. Why choose Milwaukee for that movie? And thank you. Judd Apatow: Well you know, Kristen Wiig and Amy Mumolo the writers were very tuned into the idea that there was this rivalry between the people who live in the fancy big city you know being looked down on by those people if you live outside in the suburbs or in a smaller city and that to them was part of the psychology of the movie and of this character. It was something that they talk about from day one. You know, for there to be like this rich new friend from Chicago and I think it works great. There should be more movies that take place in the Midwest for sure. Justin Barney: Yes. Amen. Alright thank you, that is it. You’re coming to town November 6 at Turner Hall. Thank you so much for being so generous with your with your time today and for everything, I super love literally everything that you do so, thank you. Judd Apatow: Thank you I appreciate that. Excited to come to Milwaukee and people can get tickets at juddapatow.com/tour. You can listen to the full conversation above and you can see Judd Apatow and his Midterms Tour at the Pabst Theater in Milwaukee, fittingly on election day. Our guest today on the Cinebuds podcast is Judd Apatow. Apatow has directed movies like, “The 40-year-old Virgin,” “Knocked Up” and “Trainwreck.” He’s written for TV shows like “Love,” “Crashing” and “Girls.” He’s been a producer on many movies including “The Zen Diaries of Garry Shandling,” “The Big Sick” and “Bridesmaids.” I don’t think that it’s a stretch to say his brand of humor and compassion has shaped entertainment today. 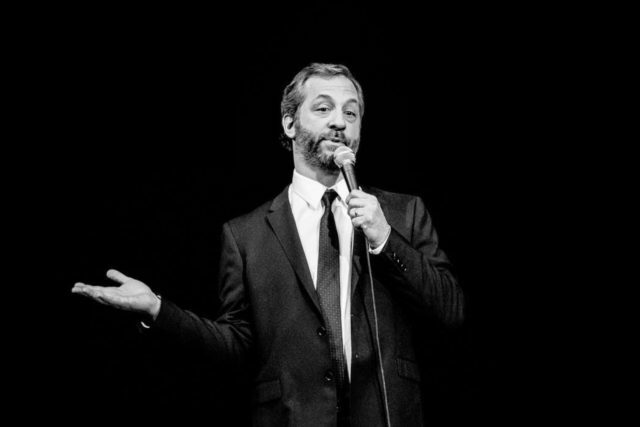 Listen to the podcast episode below to hear our conversation with Apatow about the place of politics in comedy and about his show on election night, November 6, when he will be at Turner Hall Ballroom doing standup.